Malarone is one of the most commonly taken and well known anti-malarial tablets, that is taken by millions of people worldwide. Generic Malarone contains the same active ingredients (Atovaquone/Proguanil) as Malarone but is the unbranded version. Both versions are pharmaceutically the same (i.e. they both contain the same active ingredient), however, generic Malarone is cheaper than the branded version. When GSK first launched Malarone, they had invested a hefty sum into the production of this drug, along with the marketing of it. They held exclusive rights allowing them to be the sole producers of Malarone, also known as a patent. When the patent ran out, it presented an opportunity for other pharmaceutical companies to produce the same drug at a lower price, as the research and development had already been done. Hence, generic Malarone is cheaper. How does generic Malarone work? It contains two ingredients Atovaquone and Proguanil. When you are bitten by a mosquito that is infected, the malaria parasite enters your blood stream. Atovaquone and Proguanil work together to prevent the malarial parasites from growing, eventually killing them. This way they are unable to replicate and spread inside the human body. How do you take generic Malarone? Take on tablet daily, starting 2 days before you enter the malaria zone. Continue to take one tablet daily for the duration of your stay and for 7 days after. It is very important to continue to take the tablets, even after you have left the malaria zone. This is to ensure that the tablets continue to work to destroy any malarial parasites that may have entered the body. Take the tablets at the same time every day, preferably with food or a milky drink. This helps ensure that the tablet has been absorbed effectively, as well as helping to minimize any stomach related side-effects from the tablets such as nausea and indigestion. Why do I need to keep taking these tablets after I leave the malaria zone? 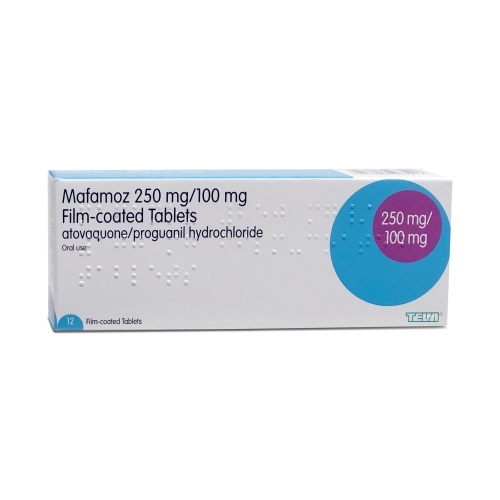 It is extremely important to continue to take generic Malarone for 7 days after having left the malaria zone. The reason for this is that it takes 7 days of continuous treatment to ensure that any malaria parasites that may be present in your blood from an infected mosquito bite are killed. As a result, parasites are unable to replicate in your body to cause malaria. Stopping tablets early reduces the likeliness of tablets working as a preventative measure. What should I do if I forget to take generic Malarone? Take a tablet as soon as you remember, provided it is on the same day you forgot. If you don't remember until the next day, leave the forgotten dose out. Do not take two tablets at the same time or within a close time frame of each other. Resistance is built up after having taken the tablets for a period of time, so missing one dose shouldn't be too much of a problem. It may be a good idea to set a reminder on your phone, to ensure you don't forget. Will generic Malarone make me feel sick? One of the side-effects of generic Malarone includes nausea. Not everybody is affected by this, but some people may be. To reduce this side-effect, it is recommended to take your tablets after a meal. By lining your stomach, you are less likely to feel sick. Generic Malarone should be taken a couple of days before you travel, which should give you an idea of how your body will react to it. If you find yourself feeling extremely nauseas or sick, try taking the tablets with simple carbohydrates such as rice, pasta or potatoes. What should I do if I vomit after taking generic Malarone? If you vomit within one hour of having taken your tablet, take another one. Don't worry about being one tablet short. Just send us an e-mail and we'll have a replacement sent out to you free of charge. Malarone is reported to be over 90% effective when used together with other preventative measures. As generic Malarone contains exactly the same ingredients as its branded counterpart, the same applies. Both generic Malarone and the branded version have been used for many years by millions of travellers around the world. It has proven to be safe and effective and has the mildest side-effect profile in comparison to other anti-malaria tablets. Who should not use generic Malarone? Pregnant women are generally advised to avoid travelling to areas where malaria is present, as there is an increased risk of complications arising from malaria to both mother and baby. In situations where travel cannot be avoided, you should speak to your doctor about which antimalarials are suitable to take. This may be dependant on a number of factors such as the trimester of pregnancy you are in and which antimalarials are proven to be safe for pregnant women. Generic Malarone is not considered to be safe for those that are pregnant due to limited research. It should only be taken under the advice and care of your doctor, who will consider whether or not the benefits of taking generic Malarone, outweigh the risks. If you find out that you are pregnant whilst taking generic Malarone, you should phone your doctor immediately for advice. If you are trying for a baby, you should delay this until you have finished your prescribed course of antimalarials. Pregnant women are advised to take extra precautions when travelling to areas where malaria is present. Breastfeeding women are advised to avoid taking generic Malarone, unless your doctor has advised otherwise. You may still be eligible to take generic Malarone, but your doctor may wish to monitor you. You are displaying symptoms of allergy after having taken generic Malarone, such as a severe skin rash or blisters, itchiness, difficulty breathing, wheezing, dizziness or swelling in any part of the body. This is very unusual and rare; however, you should seek immediate medical attention if you experience any of these symptoms. Can I drink alcohol with generic Malarone? Generic Malarone does not interact with alcohol, and you can drink whilst taking these tablets. Can I take these tablets in my hand luggage? There shouldn’t be a problem taking generic Malarone onto an aeroplane. It is a good idea to keep the tablets in their original box with the pharmacy labels. It is advised to check with the airline beforehand, as well as the country of travel, to find out if there are any procedures that need to be followed in regards to bringing in medication for personal use. What should I do if I can’t swallow these tablets? You are able to crush generic Malarone tablets, and sprinkle them over your food. We advise placing the tablet in a small plastic bag, and crushing it whilst the tablet is inside the bag in order to avoid wastage. You should then empty the contents of the bag onto your food such as a bowl of sweet yoghurt to mask the bitterness. What should I do if I lose these tablets? You should visit the local pharmacy and find out how you can obtain a replacement. If this is not possible, you can contact us and we will try our best to help you. If you lose one or two tablets, continue to take your malaria tablets as usual, and we can post you replacement tablets upon your return. Does generic Malarone provide 100% protection against malaria? All malaria tablets provide a high rate of protection and reduce the chances of getting malaria; however, no antimalarials can provide 100% protection. If you experience any symptoms of malaria within one year of having returned, you should seek prompt medical advice. Symptoms of malaria include fever, headaches, vomiting, diarrhoea, muscle pain, feeling hot. Can I buy generic Malarone online for my children or partner? Whilst generic Malarone is suitable for children to take, we are unable to prescribe to those under the age of 18. If your partner or a friend would like to buy malaria tablets online, they would need to fill out a medical questionnaire and checkout themselves, using their own account. Simply choose the number of days you want malaria cover for, fill out a short and simple questionnaire and checkout. We aim to keep our prices as low as possible and dispatch all orders as soon as possible.